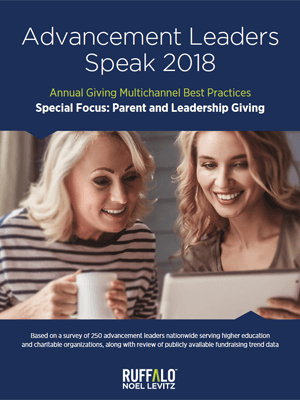 Increasing pressure on colleges and universities to raise more, more quickly means annual giving programs must evolve to meet those demands—while also adapting to the shifting expectations of a rapidly changing donor base. Through a combination of advanced analytics, personalized engagement, and industry-leading insights, RNL’s Annual Giving solutions increase donor engagement, build lasting relationships, and create a stronger pipeline of lifelong donors. What do fundraising leaders say about the state of annual giving? Read their insights, concerns, and recommendations. Why choose RNL for annual giving? See how your alumni giving compares to your peers. Evolve donor communication with this new innovation for engaging alumni and donors. RNL Personal Journey represents the future of fundraising outreach: unique donor-driven, personalized engagement across a dynamic mix of channels, delivering a fundraising message that is more relevant, more timely, and more effective for today’s donors. Align the phone channel with today’s donor behavior with RNL’s modern approach to phonathon that is fueled by advanced analytics, strategic focus, and prioritized outreach. Amplify digital giving programs, year-end campaigns, events and more with a smarter approach to digital advertising that uses the latest innovations in display advertising, retargeting, and mobile/geo location. Increase donor engagement with top-quality direct mail and email solutions that complement your campaigns and help you reach your annual giving goals.